If you are in the market for an affordable crossbow scope, and you haven’t tried any other models before, perhaps the Excalibur Dead-Zone 1952 is a feasible choice for you. It doesn’t come with the same high-end specs of some of the more expensive options out there, but it is very easy to sight in and will help you see your target conveniently and effectively even in low-lighting situations. Although it is a highly usable alternative, there is one thing that you have to bear in mind with this budget-friendly unit. This consists of the fact that it is outfitted with multi-coated lenses. In case you didn’t know, the best in this line of products are lenses that are fully multi-coated, so these might be able to transmit light a little less adequately compared to premium scopes. We’ll get it right out of the way because you might want to know off the bat whether this scope makes a good choice for your particular bow. From the information we have found in this regard, the Excalibur Dead-Zone is compatible with bows that shoot bolts at velocities ranging from 300 to 410 FPS. The weight and size of a crossbow scope can make the difference when it comes to user experience, and most archers will be aware of this aspect. Fortunately, this one isn’t too large since it measures 10.8 by 6 by 2 inches. As for the weight, it weighs less than one pound, so it won’t hang too heavy on your bow. The compact design of the product is an advantage in itself as you will be able to transport it effortlessly. Even if you mount it and dismount it time and again, you can safely carry it in a case or pouch as per your momentary requirements. It’s pretty difficult to tell whether the optical components of this scope are high-quality or not. Although most of the consumer reports received by this particular model are favorable in this sense, we haven’t found a lot of information that could sustain the statements. 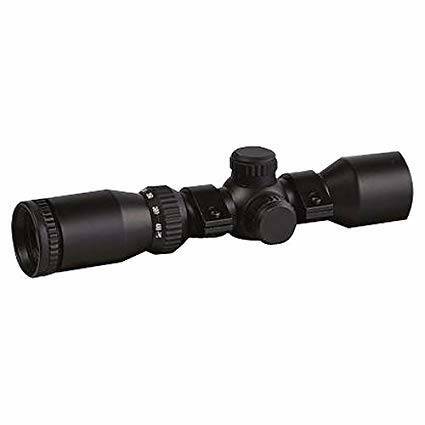 Based on what we came across while browsing through the info supplied by the brand, the optical parts of this scope are multi-coated, which basically explains its low cost. Compared to fully multi-coated optical components, multi-coated ones don’t have the same superior capability to gather light and render the images that you will look at bright and clear. However, compared to optics that are simply coated, these are good enough to meet your needs, especially if you are only beginning your archery journey. First off, you need to make sure that the crossbow is not cocked. Safe handling procedures are highly recommended at all times. Start by attaching the rings to the scope mounting area, and then separate the bottom portion from the tops. Position the scope in the cradles formed by the bottom parts of the rings, and then replace the tops, but do not tighten just yet. Proceed by pushing the scope as far as it can go, and then rotate it so as to end up with the elevation turret on top. Either bench rest or shoulder the crossbow and then pull the scope toward you (back) until you can look at the whole field of view. Check whether the horizontal components are aligned with the limbs. Wrap up the mounting process by tightening the ring tops only after you have adequately positioned the scope, and the reticle is aligned with the limbs. It’s good to know that, unlike many of its competitors, this scope doesn’t just come all on its own. It is accompanied by 1-inch rings, something you might fail to find in many other alternatives, a lens cloth, an Allen key, as well as lens caps which will assist you in extending the life of the product for as long as possible. The reticle is illuminated in red and green, and the scope has an adjustable multiplex crosshair system which will assist you in improving your hunting performance as best as possible. 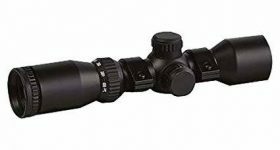 This is a decent scope for the money, but we would advise you to keep your expectations realistic seeing how this one comes with multi-coated optical components instead of fully multi-coated ones. The set does include a limited number of accessories with which you can get the most out of your bowhunting experience, but we would advise you to give it a try especially if you are a complete rookie and you don’t know what scope to pick.